Integrating easy-to-use software with Bluetooth®-enabled security devices, Master Lock Vault Enterprise delivers advanced security and streamlined access management – all while eliminating the cost, security risks and complexity of physical key management. Builders can incorporate Master Lock Vault Enterprise at every stage of new home builds – from construction to selling. Through the web interface, remotely grant and manage access to jobsites and equipment for work crews and contractors. When homes are ready for sale, conveniently share access with selling staff or real estate agents for property showings. Authorized personnel then access these secured areas via the mobile app on their smartphones. Remote access management: Issue and revoke access to jobsites, equipment and properties in real time, or schedule temporary, permanent or future access, via the web interface, optimizing scheduling and enhancing security. Complete access reporting: Easily monitor who accessed the locks and when with robust data and audit trails that increase accountability. Keyless security: Gain peace of mind because the solution eliminates the need to distribute physical keys, which pose security risks if lost or copied. Master Lock Portable Bluetooth Lock Box 5440ENT easily installs over a door knob or attaches to a fence to secure keys or key cards for jobsite gates, storage buildings and homes for property showings. Master Lock Wall Mount Bluetooth Lock Box 5441ENT installs to buildings, storage facilities and equipment to provide a permanent option for securing access to keys or key cards. 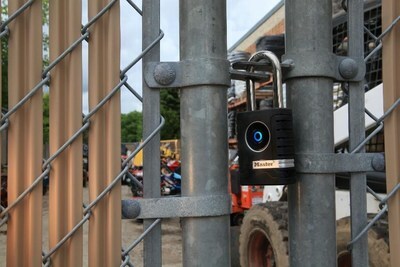 Master Lock Outdoor Bluetooth Padlock 4401LHENT secures gates, storage units, tool cases and trailers. Its durable, reliable and weather-resistant design makes it ideal for outdoor commercial operations. Master Lock Indoor Bluetooth Padlock 4400ENT secures storage cabinets, tool cribs and equipment lockers.